Laser light applied to the inside of the veins (endoluminal) is used to obliterate the region of the saphenous vein that is affected by varicose vein disease. The vein dies off and is then broken down by the body. Since the German statutory health insurers usually only reimburse the costs for classic vein stripping, patients must pay for laser therapy themselves. Who is laser therapy suitable for? 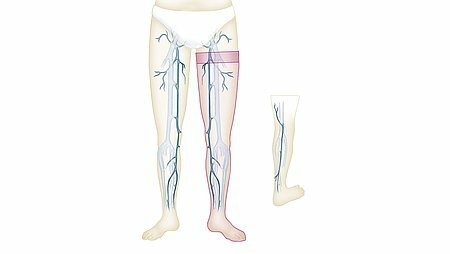 In principle, almost all patients suffering from varicose saphenous veins can have laser therapy. As with vein stripping, the saphenous vein can only be removed by laser therapy, if the deep venous system is healthy. This is checked before treatment, for example, by an ultrasound examination (Doppler ultrasonography). Since no incisions are necessary for laser therapy and there are thus no lasting scars, the procedure is most suitable for patients, who attach great importance to the cosmetic outcome. A hollow needle is inserted in the affected saphenous vein - like when taking a blood sample - above the knee or at the ankle. The attending doctor advances the light-conducting laser fibre along the vein to the start of the affected segment under ultrasonographic guidance. The laser energy emitted by the tip of the fibre heats (coagulates) the blood and the venous wall. This obliterates the vein. The whole of the affected vein segment is treated as the laser fibre is slowly withdrawn. the surrounding tissues do not become inflamed.